“You should go look at the research again and see what the charts say,” Chris Young, the Seattle Mariners pitcher, emphatically told me one afternoon this season. We were talking about high fastballs and he didn’t agree with something I’d said. In particular, it was about his high fastballs. Only four starters are throwing the fastball more often than Chris Young this year. I asked him about the pitch. Did he trust it more than his off-speed stuff at this point in his career? “Fastball command is first and foremost for any pitcher,” he said. “If you throw the ball where you want, you can get outs”. When I asked him if throwing a mid-80s fastball up in the zone was daring, that’s when things got serious. “That’s your opinion,” he told me. 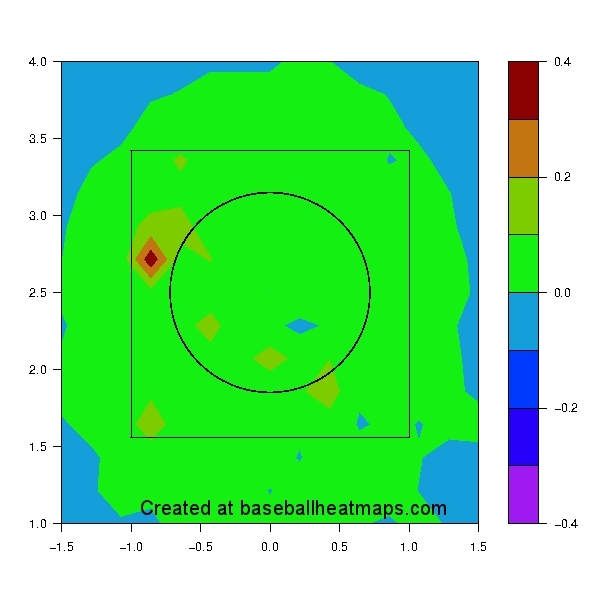 “I’ll show you a chart on every hitter that shows you that most hitters have a hole in the zone up.” Take a look at three important hitters he was facing that afternoon: Josh Donaldson, Brandon Moss and Coco Crisp (in order from left to right, versus righties, from BaseballHeatMaps). There’s something to be said about his information. 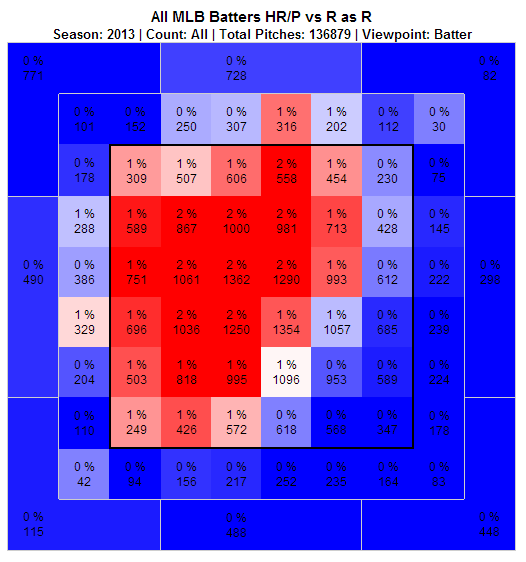 Crisp was pretty much the only hitter Young could point to as a high-ball hitter. It turns out, he’s on to something… maybe. The fact that low pitches mean ground balls does not prove the inverse. High pitches do not — necessarily — mean more home runs. 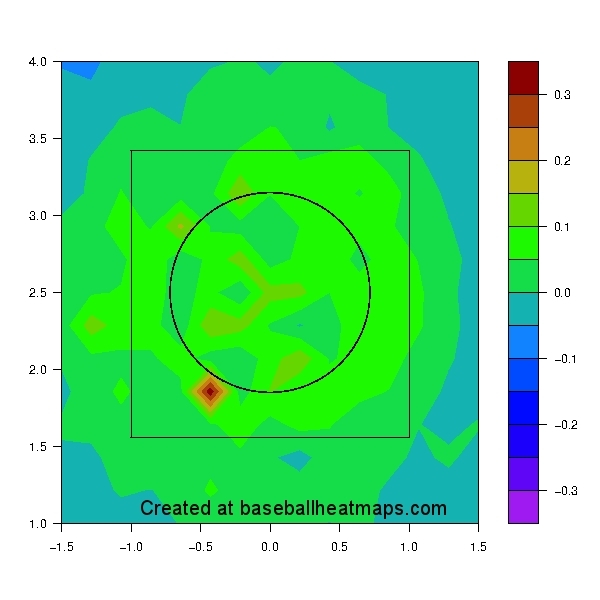 Check out the heat map for home runs below (again for righties against righties on fastballs). Well, hello. There are fewer fly balls down in the zone, perhaps, but when a hitter gets a hold of one of those, it’s more likely to be a home run than fly ball pitches at the top of the zone. Golfing works. 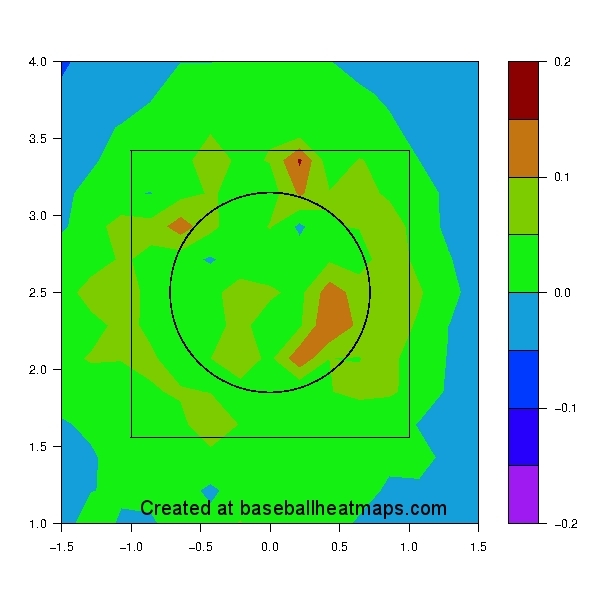 And maybe you noticed both heat maps had a hole high and tight, a place Chris Young likes to go. “Working vertically is just as important as working horizontally,” Young said. “Being able to locate the fastball gives you four different pitches: down and away, up and away, down and in and up and in.” Up and in, in particular, is a great spot to hit, it looks like. 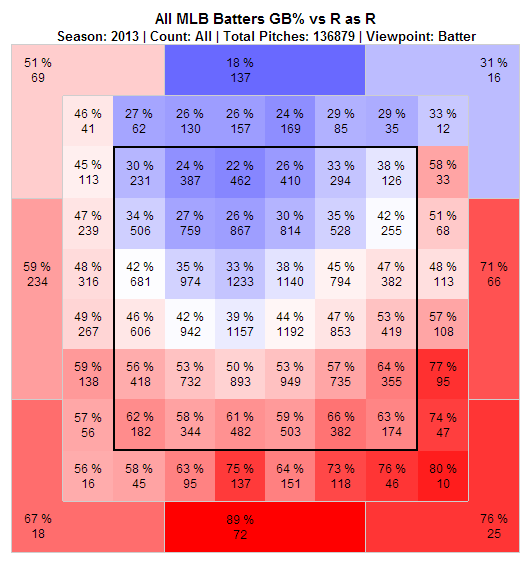 And since Young also thinks generalities are less important than the particulars of each batter, it’s interesting to return to those specific charts above and remember not all hitters can turn a high fastball into a home run. 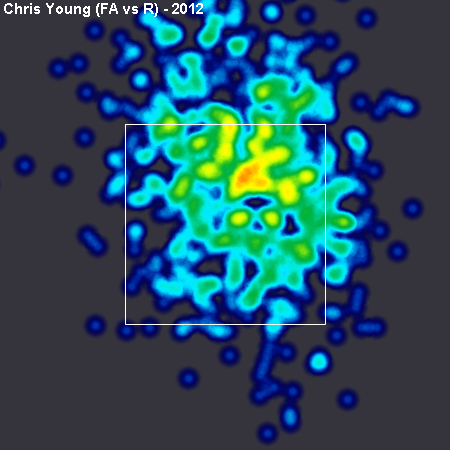 To some extent, Young is in a great place to take advantage of a high fastball. He’s six-foot-10 and acknowledges that hitters sometime call his fastball “invisible.” Some part of this is perceived velocity, since he releases his fastball closer to the plate. Eric Seidman once investigated this phenomenon in great detail and found hitters might perceive his 84.4 mph fastball as if it were a 91.1 mph pitch. But that’s just math. There might be more to it. “I don’t know if it’s spin rate or the way a pitcher hides the ball, or the angle of the pitch, there are a lot of different variables” that go into perceived velocity, Young said. This is important, and not just because Sean Doolittle exhibits how important it can be or Tony Cingrani uses the same glove flip or Ryan Dempster once revived his career with a waggle. “When an organization or team figures out how to measure that, they’re going to be able to identify at an earlier stage players that are going to play at the big-league level and those who aren’t,” Young said. “There are so many guys that throw hard but it doesn’t always translate to success.” And Young has been lucky to have it. He’s heard hitters say his fastball “gets on you” no matter what the gun says. (“When I threw a little bit harder, they really said it.”) But what part of that deception is reach, what is his angle and what is his vertical pitching style? That’s left for future research. * Correction: A smart, 35-year-old pitcher with a mid-80s fastball. Thanks to David Appelman for the beautiful charts above. 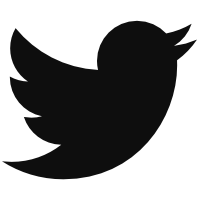 We hoped you liked reading Chris Young Challenges the Data by Eno Sarris! What Makes a Team Good at Replay Challenges? 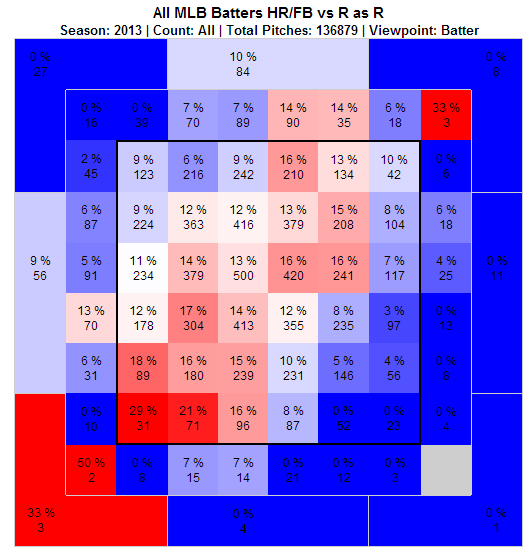 The “uses the same glove flip” Cingrani reference links to Doolittle’s article. Intentional?